I’ve always loved to read, but the study of literature has never been easy for me. I think a lot of that is because I was never really taught how to analyze literature in school. I remember studying the basics like characters and plot, but finding the theme is still a difficult task for me. That puts me in a somewhat unusual position as a homeschool mom. I do not fear teaching advanced math and science to my children, but literature and other liberal arts studies frighten me! Thankfully, I do not have to design a literature program myself. Nor do I have to determine what questions to ask my students. There are people who do understand literature and how to teach it who have written curricula for parents just like me. Two of those people are Michael and Rebecca Gilleland, the founders of Progeny Press. The Gillelands began homeschooling in the early 1990’s and immediately discovered the lack of quality literature studies available to homeschoolers. So they decided to write them. The rest, as they say, is history, or in this case literature. Today Progeny Press offers over 100 literature guides for students in elementary through high school. Each of these guides includes not only the basic nuts and bolts literature questions, but goes further, challenging the student to think deeply. They also emphasize Christian principles throughout the studies. Their company mission statement provides an excellent description of how the tenets of the Christian faith are intertwined in these studies of great literature. Our purpose is not to bring you only “safe” fiction, but to teach literature that is well-written and that will help students develop and refine how they deal with man’s philosophies in relation to God’s word. Progeny Press examines literary terminology and technique in good, cultural literature to equip students for understanding the craft of writing and to enhance their joy of reading. With these things in mind, we promise to bring you good literature, provide good literary analysis, and measure it by the light of scripture. 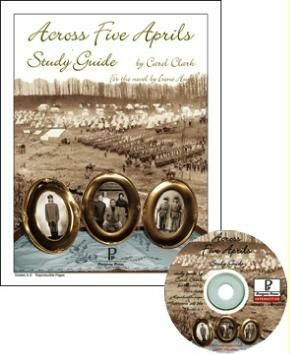 I recently received an interactive pdf copy of the study guide for Across Five Aprils to review. This guide is designed for students in 5th-9th grades. I have had my 6th grade daughter working through the guide. She absolutely loves historical fiction, and I felt that she would be a great tester for this product. She has very much enjoyed this study guide. She has not completed all the writing assignments that are included in the guide because she had other writing that she was working on, but the questions have helped her to understand the book much better. They have made her read more carefully and critically. There have been very few that she was unable to answer, but thankfully the guide does come with a key. You can view sample pages here. Ideally, I would read the book too and go through the guide with her. But I just don’t have time in this season of my life to do that. Flexibility is one of the benefits of homeschooling. I love that there are companies like Progeny Press that produce high quality curricula that students can use independently if necessary, or with as much parental involvement as desired. I will definitely consider purchasing more of the Progeny Press guides. The study guides are available in several formats. I received the e-mail attachment pdf, but they can also be purchased as a booklet, a CD, or both. The e-mail attachment is the least expensive option at $16.99 for the study guide I received. Visit their website to see their entire selection of literature guides. Disclosure: I received this product for free in exchange for my honest review. I was not compensated for this review. All opinions expressed are my own.